Now optimized for iPhone 5 and iPod Touch 5! 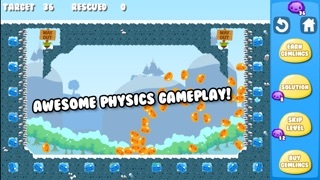 From the creators of Bloons and Bloons TD 4, this amazing puzzle game takes you on a tap-happy physics adventure to save the Meeblings. Premium quality gameplay - for free! 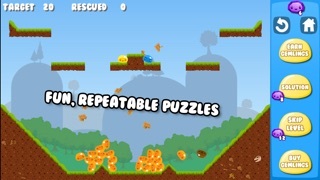 Updated with 12 fun new levels! Lost amongst 72 puzzling levels, these little heroes must use all of their powers to find the exit and get home. 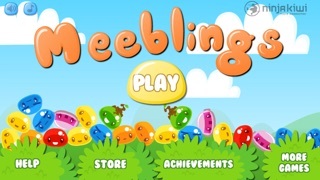 Push, pull, play with gravity, power on and off, burn through terrain, grow trees, create exits, and transform into other meeblings - use any of these tricks plus your own smarts to get enough meeblings to the exit. Master each power to pull off incredible physics stunts and use multi-touch controls for even more fun, or to play with a friend. Earn Gemlings when you win levels, then use these to look at solutions or use fun Level Skips, which keeps the game kid-friendly even if they get stuck. Great gameplay, cool physics powers, repeatable fun levels, and ways to get past tricky levels - all for free from Ninja Kiwi. 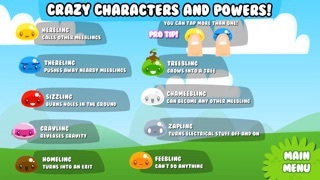 MORE AWESOMER FEATURES ★ Unique, fun physics play across 72 diverse and challenging levels ★ 8 cool meebling powers to go crazy with ★ Use multi-touch to double or triple your physics force - it's awesome to send the meeblings flying ★ Earn Gemlings for passing levels, and for mutliple replays - then use Gemlings to unlock new content and get past tough levels ★ Two cool ways to get unstuck - Solutions let you see one way to pass a level, and Level Skips give you the unbridled power of the Meebling-Vac! 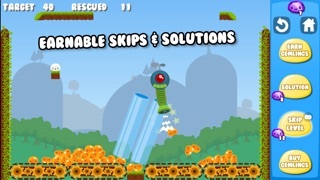 ★ Plenty of challenge, but kid friendly and super-repeatable, too Now go play and enjoy! Make compatible with latest iOS! Would you PLEASE update this game for newer versions of the iOS operating system so I can get it and play it again? I miss it so much! I love this game but it won't work on iOS 11 Please update !!????!!!!!?!!! 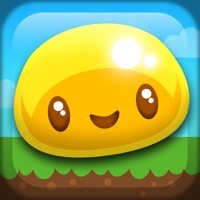 Can you please support this fun game for iOS?